Juvenile northern short-tailed shrew, Blarina brevicauda. Photo by Jamie McCarthy. Assuming, of course, that you haven't already met. The Soricidae are a family of small insectivorous mammals found throughout Eurasia, Africa and North America, with a small number of species extending to South America. By mammal standards, this is a fairly large family with about 370 species currently recognised and a small but steady trickle of new species still being published such as Sylvisorex akaibei from the Congo within the past year (Mukinzi et al., 2009). Caravan of house shrews, Suncus murinus. Photo from Osamu Matsuzaki. Living shrews are usually divided between two subfamilies, the Soricinae and the Crocidurinae, or the red-toothed shrews and white-toothed shrews respectively (Dubey et al, 2007). 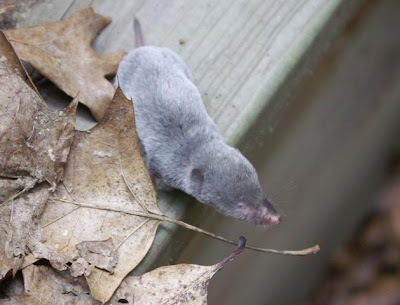 Red-toothed shrews, found in Eurasia and the Americas, are named after one of their most unusual features, red crowns to their teeth due to the deposition of iron in their enamel (this feature has been lost in a few soricine genera). White-toothed shrews are found in Africa and tropical Asia and make up for lacking the funky tooth pigment of Soricinae by including such creatures as the insanely over-developed hero shrew Scutisorex somereni and the bewildering diversity of the genus Crocidura with in excess of 150 species. 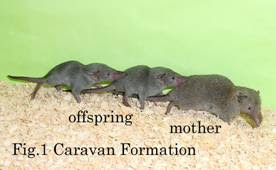 Other notable features of shrews include the production by at least some species of toxic saliva, and the formation by young shrews of 'caravans'. One youngster will grasp its mother's rump in its mouth, its own rump will be grabbed by another, and so on until the entire brood forms a train by which the mother will lead it about. The young shrews will remain determinedly clinging to each other even picked up and dangled above the ground like a living monkey chain (Nowak, 1999). 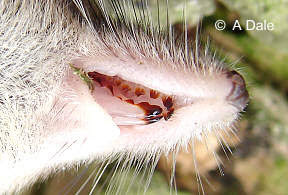 Close-up of mouth of a common shrew Sorex araneus showing the red teeth. Photo by A. Dale. Most shrews are terrestrial generalists though a number of species are semi-aquatic, particularly in the soricine tribe Nectogalini. The American and Pacific water shrews, Sorex palustris and S. bendirii, are capable of running short distances across the surface of water due to their small size and hairy feet. The little-known central African Ruwenzorisorex suncoides has large premolars that have been suggested to indicate a diet of molluscs. In contrast, the mole shrews of the genus Anourosorex are (funnily enough) mole-like burrowers feeding on burrowing insects and earthworms. Dubey, S., N. Salamin, S. D. Ohdachi, P. Barrière & P. Vogel. 2007. Molecular phylogenetics of shrews (Mammalia: Soricidae) reveal timing of transcontinental colonizations. Molecular Phylogenetics and Evolution 44 (1): 126-137. Mukinzi, I., R. Hutterer & P. Barriere. 2009. A new species of Sylvisorex (Mammalia: Soricidae) from lowland forests north of Kisangani, Democratic Republic of Congo. Mammalia 73 (2): 130-134. Is there any hypothesis/data about the function of the iron deposition on the teeth? Iron deposits in enamel have been suggested to strengthen the teeth, and Motta (1987) showed that among butterflyfish species (some of which also possess iron-rich teeth), species with higher iron concentrations fed on harder foods. It still raises the question as to why only some shrews have such deposits (which have been lost in some Soricinae). Also, this info sheet notes that teeth of Neomys fodiens (water shrew) still wear down pretty quickly despite their iron deposits. Motta, P. J. 1987. A quantitative analysis of ferric iron in butterflyfish teeth (Chaetodontidae, Perciformes) and the relationship to feeding ecology. Canadian Journal of Zoology 65: 106-112. The Soricidae are a family of small insectivorous mammals found throughout Eurasia, Africa and North America, with a small number of species extending to South America. Ah, but do you know if there are also shrews in Australia? Re: "The American and Pacific water shrews, Sorex palustris and S. bendirii, are capable of running short distances across the surface of water due to their small size and hairy feet. " I have read that the ultimate cause of death in the rare wild shrew (of some species) that makes it into its second year is often starvation due to worn out teeth. So an adaptation that hardens teeth might plausibly be adaptive. As Christopher says, Oz is marsupial country. But a lot of the small species collectively known as "Marsupial mice" are carnivorous (polyprotodont dentition, more like primitive mammalian condition, as opposed to the "rodent-like" (yes I know that's a gross oversimplification!) diprotodont condition in typical herbivorous Aussie marsupials) and might better be called "marsupial shrews" on anatomical and ecological grounds. As Christopher says, Oz is marsupial country. Actually, if you tally up the number of species, I believe Australia would be rodent country, with marsupials coming a distant third after bats. Not "a lot" - they all are, generally feeding on insects. Offhand, one thing that small dasyurids are known for (other than their wild uncontrolled orgies) is their willingness to tackle prey such as grasshoppers that may be as big as, if not larger than, themselves. And to get to Christmas Island from the Australian mainland you have to go via the international, not the domestic, airport. Surely that counts for something. But still, at the end of the day, policies concerning (for example) the conservation of endangered Christmas Island taxa are the responsibility of Australian authorities; is this not so? And in that sense, if in no other, there is such a thing as an "Australian" species of shrew. Interestingly, toxic saliva seems to have evolved independently more than once in shrews. The soricines Blarina and Neomys (which are only distantly related) definitely have it, but there is also a report suggesting that the crocidurine Crocidura canariensis has a venomous bite (Lopez-Jurado & Mateo, 1996). Those shrew species which are known or suspected to be venomous tend to be relatively large (by shrew standards); perhaps venomous saliva is an adaptation for tackling larger prey? Lopez-Jurado, L.F. & Mateo, J.A. 1996. Evidence of venom in the Canarian shrew (Crocidura canariensis): immobilizing effects on the Atlantic lizard (Gallotia atlantica). Journal of Zoology, London 239, 394-395.